Photo from House of Yes' newsletter. If you live or love Bushwick, chances are you've ended up at House of Yes, the event space that holds magical circus acts and aerial classes. Just off of the Jefferson L stop, housing our fave falafel spot, Queen of Falafel, House of Yes is one of the best places to party hard in the neighborhood. In the wake of Bowie's death, just a mere two weeks ago, HoY started hosting Little Cinema's immersive pop up of films starring Bowie himself. The night starts off pretty easy: Little Cinema puts on a film that stars Bowie, while a dance party breaks out during said screening; and live music and spoken word are performed throughout the night. Past screenings at the whimsical hall included Labyrinth and The Man Who Fell To Earth. A little skeptical about how it all works? Check out this clip from the Labyrinth screening! 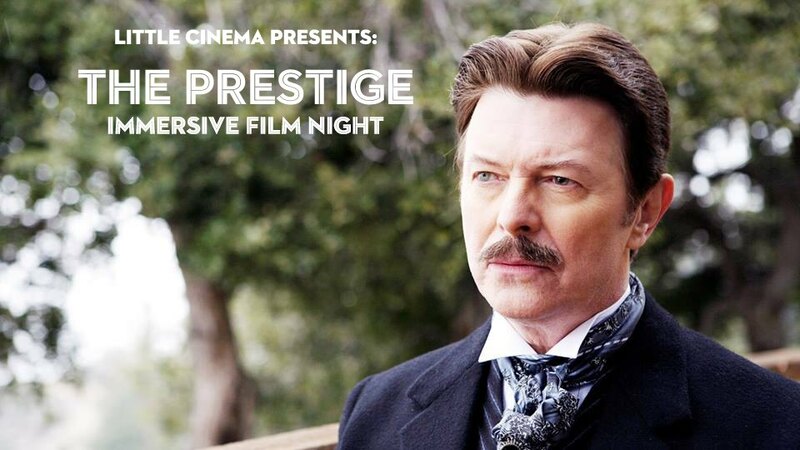 Tonight's screening is one that only true Bowie fans know: The Prestige. Full disclosure, I've never watched The Prestige, but I know that it's the better one of two magician movies of 2006, *ahem* I'm looking at you, The Illusionist. In The Prestige, Bowie plays the Serbian-American inventor/engineer, Nikola Tesla. But aside from watching the rock star act with grace, tonight's event is a little special. Along with the dancing, this event will have a magic show put on by the one and only Adam Cardone. Cool fact: Cardone even consulted on The Prestige! So come one, come all, to The Immersive Prestige at House of Yes! If you wear a top hat or a cap to the event, you'll get a free drink! Tickets are $11.35 and you can purchase them here. The Bowie party start at 8:00pm, and will last about two hours, unless everyone keeps dancing to "Let's Dance!" all night long. House of Yes, 2 Wyckoff Ave, Bushwick, two blocks south of the Jefferson L train stop. For more information on this event, please visit the event's Eventbrite page, or House of Yes' Facebook page.